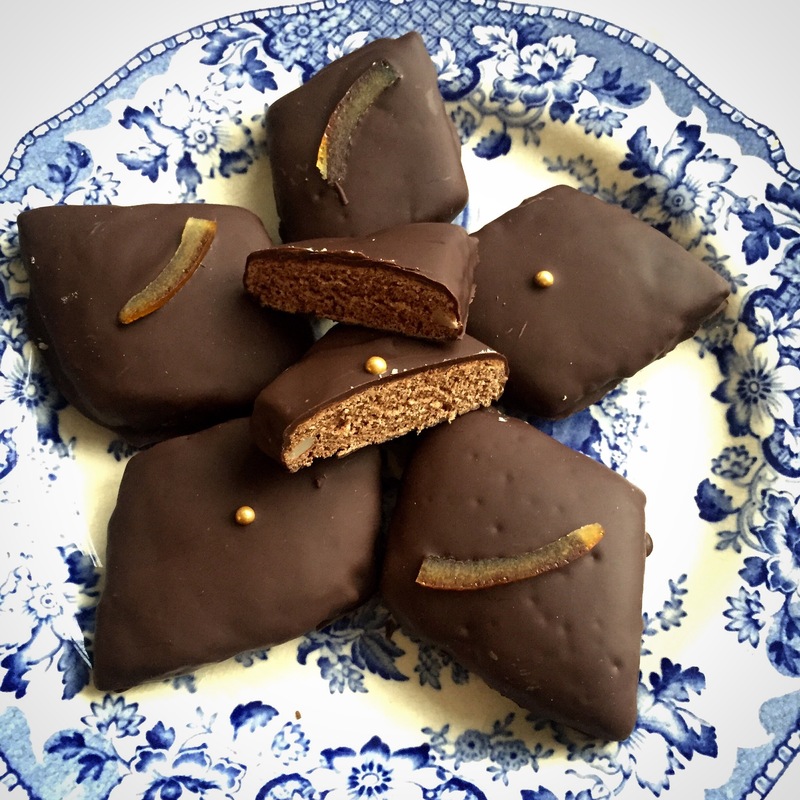 These spiced chocolate cookies have a special place in the heart of Neapolitans and southern Italians; for diaspora the scent of mostaccioli conjures up sentiments of Christmas. These rhombus shaped cookies are an essential part of our festive season and are always found along side other fragranced traditional sweets and cookies like Divino Amore and Rococo. My recipe mildly reduces the amount of sugar usually called for. They are also slightly softer than other mostaccioli we have almost broken teeth on over the years. Place flour, sugar, bicarb, spices, cocoa and chopped almonds into a large bowl and mix with a wooden spoon. In another bowl combine eggs, zest, apricot jam, honey, water and wine. Make a well in the centre of the dry mix and pour the wet mix in gradually, bringing together with a wooden spoon. Turn out on a floured surface and combine with hands until dough is well mixed. Cover with cling film and leave to rest in the fridge for 24 hours. Once rested, roll out on a floured surface to 1 cm thick. Cut into rhombus or diamond shapes, about 5cm long on each side. Place diamonds onto a flat baking tray lined with greaseproof paper. Make sure there is enough room between the cookies to allow a little expansion while cooking. Brush with water and bake in a preheated oven at 180 degrees C. for 20 minutes. Once cookies have cooled completely, immerse in melted dark chocolate. I use meat prongs to do this as they allow me to manoeuvre the cookies around while letting excess chocolate to drip back into the bowl. Decorate each with a slither of candied orange peel, golden candy ball or simply leave plain then place in fridge to set. to loved ones for Christmas – perfect with marzipan cookies, Divino Amore.